Have you hit a road block? 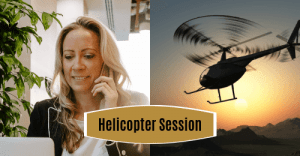 A Helicopter Strategy Session is led by you. Abigail will help you get the perspective (a helicopter view) you need to smash through you current roadblock. In the session you'll devise your action plan, the tweaks, you need to make to your marketing message (to get more conversions), how to use social media and your website more effectively (for business development) or learn how you can master your time management & get more productive. If that’s you then let’s book a call today to discuss when we can get started. (1/2 day & full day Option available starting at £595, online & in person on request).